I truly believe that the best things in life are the ones you don’t plan too much for. And our first meal in NYC happened to be one of those. We had been walking all morning (we walked A LOT, but more on that later) and stumbled upon the legendary Katz’s Deli just as we were getting hungry. Taking that as a sign, we settled down for lunch. And god, what a good idea we had then! Neon signs and loads of happy customers welcomed us in. It was still relatively early in the day (I blame jetlag for our unusual lunchbreak timings! ), but the restaurants was positively busy already! We grabbed a couples of drinks to try out while reading the (extensive) menu… The kitchen team is amongst the nicest we’ve met in NYC and will happily let you try anything. I think it’s meant to help you make your decision, but I’m not sure it really helped me as everything was absolutely delicious! Having taken a peek over neighbouring tables’ plates, we finally settled for the (gigantic) Reuben sandwich with fresh & pickled gerkins. Not only did it look epic but the meat was seriously smokey and very more-ish. The accompanying pickles freshened the whole thing up quite nicely. All in all, a beautiful beast of a sandwich and one of the best I’ve ever had! Once the billion necessary pictures taken, it was (finally) time to tuck in! Somebody was really excited about it! What? The best sandwich I’ve ever had (Reubens on Rye). Why? 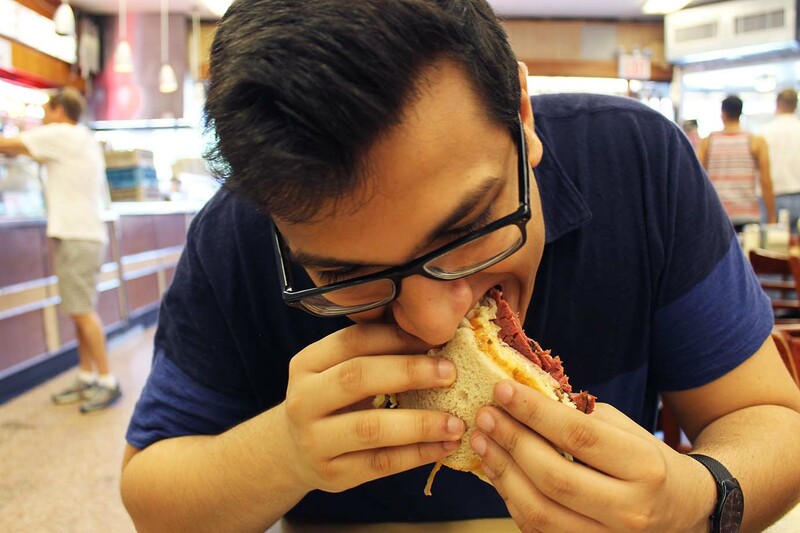 Katz’s Deli is an institution for a reason. 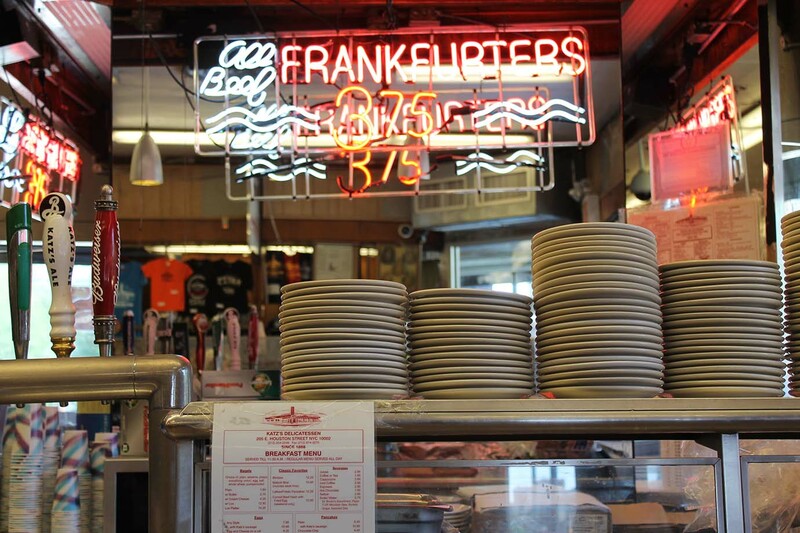 It’s a no-nonsense, cash-only sort of place, but they definitely know their way with meat. How much? About $20 for two with drinks. Portions sizes are GIGANTIC, so you’ll have more than enough if you share, which makes it one of the best deals I’ve ever came accross! Oh my that looks fantastic! I’ve been to NYC for a school trip many moons ago and I haven’t managed to go back but I definitely want too! It was one of the best food we had in two weeks! The meat was so soft and smokey! Craving this right now! I see you found your way to Katz’s! Ahh, my old stomping grounds! I did and I’m so so so glad for it! It was SO GOOD! I am so happy to see that you are posting about your time in NYC! It is definitely one of the cities on my bucket list, and I am looking forward to reading about your adventures. Thanks for the kind words lovely! Off to check out your blog now! it looks like a really cool place and the food looks good! Oh, it was! Such good value for money too! hahahaha! You deserve a “best comment award”! This looks delicious! I’m hungry just reading your post! 😥 I need to visit! I can only with that statement. Easily one of the best meals I had in NYC!